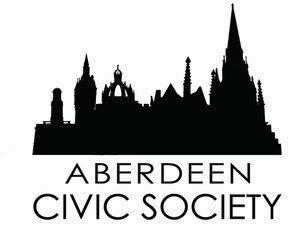 Aberdeen Civic Society is a membership organisation whose aim is to stimulate public interest in the built environment of Aberdeen and encourage the preservation, development and improvement of public amenity and interest in the city. We also encourage high standards of architectural planning. We have a small executive committee who put in place events and activities that promote our aims. 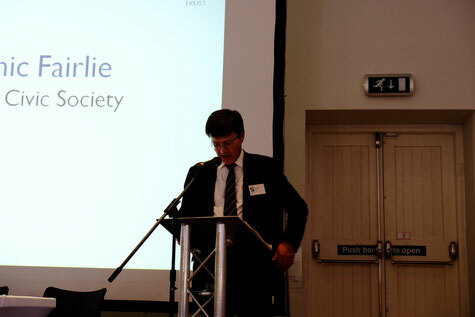 We are a registered charity and are affiliated to the Scottish Civic Trust. We receive no public funding, and pay for what we do out of our modest annual membership fee. The conference today is specifically on Housing in Scotland, with the added line about “Learning from the Past, Building for the Future”. This part of the conference is about Communities under Pressure. Housing has worked its way up the political agenda. Open any newspaper these days and housing will regularly fill a comment page, letters or editorial. Our politicians appear to have responded to this in the only way they know, by increasing regulation. Guiding an application through the planning process has become tricky, often starting 10 or 20 years before anything is built on the ground. Over the relatively recent past, certainly relatively recent in planning terms, there have been changes to the local development planning process, all brought in with the goal of making the process more visible, controlled locally and quicker. The changes include increased pre-application consultation, additional studies and reports and a whole raft of national and local policies and guidance on almost everything from how to produce good design, how to design roads and how to accommodate affordable housing. However, despite all of these good political intentions – what has been achieved? Has the process become quicker, is it more locally accountable and is it yielding better outcomes? My answer is NO. Are we seeing developments being built today that people are happy to see in their community? NO. Are the public able to rest easily, confident that they can rely on the raft of policies, to make sure that developments in their area improve the built environment rather than detract from it? NO. And on the other hand, is the community full of NIMBY’s who are against all change just for the sake of it? Again – my answer is NO. Let me turn now to Aberdeen. Despite recent falls in the price of oil, Aberdeen has had the benefit of a buoyant economy. This is good, because it is much easier to manage a growing economy than a contracting one. The oil industry has kept Aberdeen busy, particularly over the last few years when other parts of the country have been less fortunate. So if you measure a community under pressure by the sheer amount of development taking place and proposals coming forward, then Aberdeen – and for that matter Aberdeenshire - is indeed a community under pressure. There have been a number of proposals in Aberdeen that have attracted considerable attention. For example, the Aberdeen Western Peripheral Route, proposals for Union Terrace Gardens, the extension to the Art Gallery and the MUSE development at Marischal Square. In March this year Urban Realm magazine gave Aberdeen its “Plook on the Plinth” award for 2015 and noted that Aberdeen is the place where Architecture goes to die. I am not sure I agree with Urban Realm as Aberdeen actually has some of the most stunning architecture in the UK, although it is true that not much of it is recent development. Even I have to admit that modern development in Aberdeen is somewhat lacking. Alas, much of it does not have a good level of public support. It is not just the architecture that is not learning from the past, it is urban design as well. So how come have we ended up here? One of the key elements of the Scottish Government policies introduced about 10 years ago was increased public consultation. In Aberdeen Civic Society we try (within our limited means) to engage in public consultations, although it is sometimes difficult to do it all. The amount of it is now huge. The public consultation process is confusing. Attending and commenting on any development as part of any pre-application consultations seems to achieve little. Indeed there is a growing scepticism and some people think that by commenting at this very early stage it gives the developer an early warning of issues and allows them to work to circumvent the problem rather than address it head on and provide a good solution. Concerns expressed as part of this early public consultation seem in practice to be ignored. Financial pressures take precedence over good design. Individuals who take the time to attend the consultation events and make their comments believe that their contribution will be taken into account. Often they will not be aware that in order for their points to be made visible to those who are going to take the final decision (ie local councillors) they need to keep repeating their comments and objections multiple times and right up to the actual planning application. In order therefore to properly comment on any planning application, you need to understand a complex system. Not many people have this amount of perseverance and to properly engage with any application, particularly a large one, takes a considerable amount of time. The second point I would like to make relates to the fact that at Aberdeen Civic Society we are not against development. In fact far from it. We fully understand the pressures that exist – particularly when it comes to housing - and we are not a group of objectors just for the sake of it. Yes, members of the Society have different opinions about proposals – and there is nothing like a controversial development proposal to raise heckles. What gives us a much bigger problem is that the standard of design is as low as it is. A particular design issue that I have is that there are a wide range of different ways that the city could develop, but I have yet to see an overall plan that makes sense. Plans do exist – for example there is the Local Development Plan – but this often tends to be a listing of opportunity sites and policies. There is little urban design that has gone into developing it – and even less planning for our neighbourhoods. I think it is impossible to get good development without a set of guiding principles to ensure that the development adds to the existing built environment rather than detracts from it. Any development needs to respect the area in which it sits. It does not matter if it is a development on a brownfield site in the middle of a built up area or on a greenfield site on the edge or even outside the built up area, then you still need to use a set of good principles to ensure that the new development makes a valuable, and long term, contribution. Too often all that is studied as part of the planning process are things like landscape, traffic or ecology. There is little that goes into making sure that the development will make “a place”. We have beautiful places in and around Aberdeen, all of which we could learn from, but we choose to believe that learning from the past involves learning only about architecture. Architecture is indeed an important ingredient. But is it not just as important to learn from the way development and neighbourhoods are formed. If we learn anything from the past, can we not learn from them both? My third point is related to this. Most contentious proposals for development are for the city centre. In Aberdeen’s case the wellbeing of Union Street is high on most people’s agendas. However, recent proposals, and actual developments in the city centre tend to be commercial rather than residential. There is a belief amongst those people who make the decisions, that to make the centre perform better, it needs to have commercial development (more shops, offices, hotels and leisure) and this is encouraged into the centre at the expense of the resident. In Aberdeen we are beginning to see very high buildings going up in the centre, often completely out of character in terms of height, mass, materials, shape and form with the historic areas in which they will exist. In approving this type of development we are not learning from the past. We are making fundamental changes to the city centre in the belief that the health of the centre can only be improved by re-development, over-development and commercial uses alone. In the past the centre of Aberdeen would have been a mixed use area, and by mixed use I mean residential and commercial. What is happening is that the residential element is being chased out of the centre – only to be replaced by commercial activity. We are changing our city and town centres from mixed use areas into commercial zones – with all the complications this brings. Think of that out of town office complex – that is what our town centres are becoming. So often the wellbeing of the centre depends on what happens in it just as much as what is happening to development at the edge of town. It may be that developments on the edge of the built up area – which tend to be very low density - actually has a much bigger impact than what happens in the centre. Aberdeen City Council has recently commissioned a masterplan for the centre and we took an active role in this work as it went through its public engagement phase. However, the masterplan that has now been adopted seems to be more of a listing of opportunities in the centre, with little consideration of what is happening, or what should be happening further out. I believe this is missing the point. The fourth and final point I would like to make relates to infrastructure and traffic in particular. Increases in traffic are often used as reasons for objecting to proposals on the outside of town. We can all point to examples of development that - once built - changes the way that our roads function, particularly at peak times. In Aberdeen we have had recent large development of out of centre commercial estates. In the morning traffic moves to these new developments and in the evening it all moves away again. This happens even though the council is trying to get people to use public transport and reduce commuting by private vehicle. Aberdeen I am sure is not unique in this regard. Unfortunately many of our members get extremely worked up about traffic. I have not really and specifically addressed the issue of housing, but housing development and commercial development are linked. When, in Aberdeen Civic Society, we comment on development proposals, we are so often commenting on what happens in the centre, and the centre is being taken over by commercial activity at the expense of the resident. Some parts of the centre are really beautiful, and we need to work hard to keep it that way. It is all too easy for a property owner to allow their property to deteriorate to such an extent that it is no longer commercially viable to repair. Take that building in Union Street that was originally a mix of residential and commercial – it has been empty for years, and has trees growing out of the roof. The financial case takes over, and redevelopment of it is often allowed, and sometimes welcomed as the least bad option. Surely this is wrong - the owners of property in the centre should not be allowed to build inappropriate development in the centre – their most important contribution should be to repair and maintain. If they do not do it, why can we not have policies that force it to happen? Is Aberdeen a community under pressure? The answer is yes, and in Aberdeen Civic Society we see that so much of this pressure comes from increases in commercial development rather than residential. Are there a good set of policies that will make it work better – I don’t think there are. I do not think that housing is the problem – I think it is the over-development of our commercial zones that is creating a much bigger and wider problem. I like the idea of learning from the past and we could do this better. The largest single issue we could learn about from the past is how to build mixed use neighbourhoods that function. This is something that should be at the heart of our development planning process. Good urban design of mixed use neighbourhoods is probably more important than the architecture itself. The concentration in one particular place of commercial development in our towns and cities is not a good thing. I believe single use zoning – be it for housing or commercial - is positively bad for development and bad for our communities. If there were one thing that would make development work better it would be to ensure that all development contains a mix of commercial and residential property.